This is offered at Trinity from Year 6 through to Year 12. The students from Years 6 to 8 have a double lesson for a semester and experience varied media including; clay, watercolour paint, tempera paint, pencil, papier-mache and inks. Techniques introduced at these levels are painting, sculpting, modelling, drawing and designing. Year 9 and 10 students may choose to study Visual Art and Design and build on the knowledge and skills learnt during previous years. They also learn to use scanners, digital cameras and digital imaging software. Larger works are developed at this level, using new media like dry pastel, air brush and mixed media. The work of all students is displayed during the year at an evening exhibition. 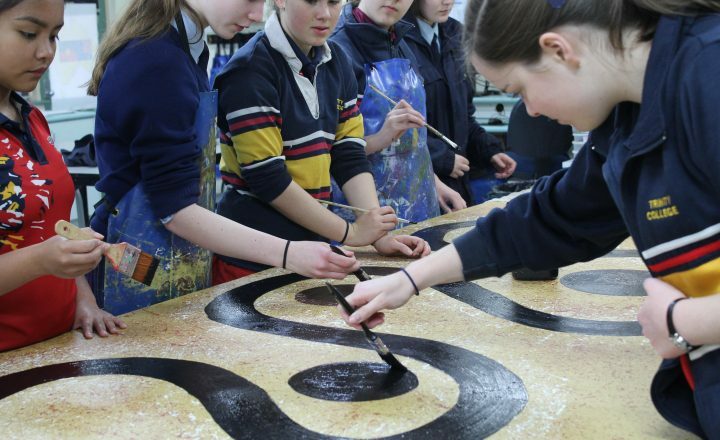 The Senior School offers Visual Art and Design in Years 11 and Year 12. Students are able to work on practical projects which best utilise their personal skills, interests and abilities. The facilities offer a large studio/classroom and a design room with 20 computers. The Trinity Senior Art Show is a well-known part of Term 4, when student work is exhibited and often offered for sale. Works range from large canvasses, photography, sculpture, installations and design projects. The College also participates in the annual South Australian Living Artists Festival (SALA), hosts a photography exhibition and SACE Works presentation in the purpose built SPACE Gallery. The new Australian curriculum requires students in Early Years to Year 6 to undertake dance, either as part of the Arts or Physical education. Trinity College students are able to choose dance as an option subject in Year 9 and Year 10, dependent on numbers. The courses are open to all students and focus on communicating through dance. There is a strong focus on composition and choreography and students are able to create their own dance work. Trinity College Drama productions provide students and our community with vibrant cultural experiences across a range of theatrical styles. 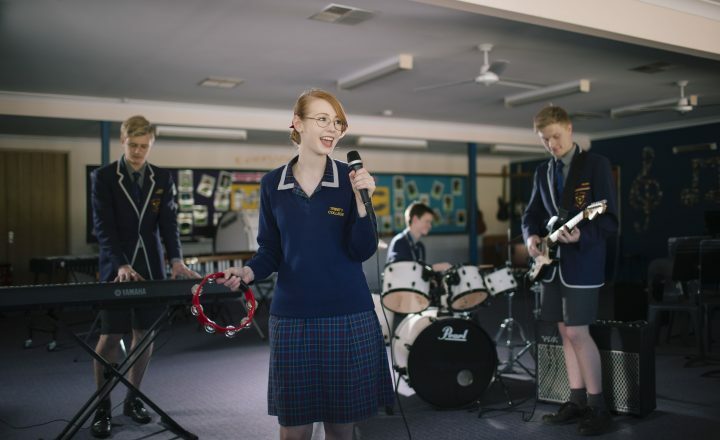 Well established and purpose built facilities at each of the schools enable the presentation of productions that are unique to their school, while still enabling students to work in partnership on whole College enterprises. The four Early Years to Year 10 schools offer an identical course, with individual focuses being adopted by each school according to the needs of their students and the particular cultural aspects that may be promoted by the respective school. The course aims to develop group work skills, encourage creative expression and foster personal organisation and reliability. For the individual student, the course aims to develop skills onstage as a performer and/or offstage in direction and technical work. At an analytical level students are taught how to observe and analyse live performance. Students will experience a range of activities that build concentration and confidence, provide opportunities for small and large group improvisation and large group production and which include visits to live theatre and review and production essay writing. 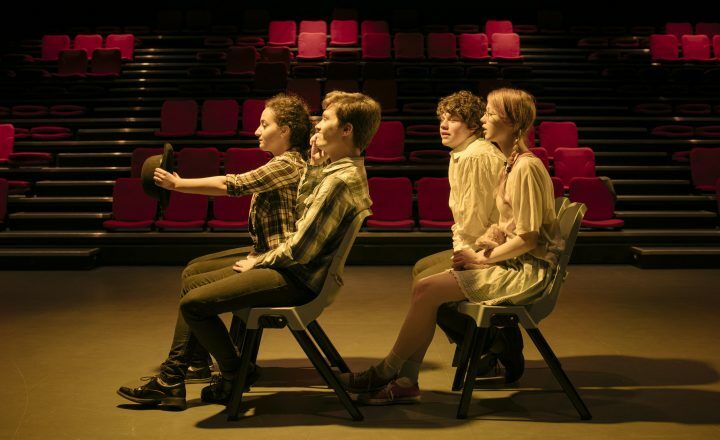 Drama is offered as an elective subject for students from Year 9 to Year 12. No prerequisites are required for movement through the curriculum in the Middle School. Drama in the Senior School is governed by SACE requirements as dictated by the PES Drama Studies and SAS Drama course curricula. Drama is also offered as an experiential learning opportunity on an individual school basis, from Year 6 onwards. Throughout the course of the academic year students in Years 8 to 12 are engaged in the rigour of producing productions performed to the wider community. Students experience all aspects of production ranging from technical production, light and sound, acting and script writing, through to catering, front of house and ticketing. Each of the four schools offers independent productions. Whole College productions enable students to participate in vertical age group experiences that bridge all aspects of the Performing Arts. Previous musicals have included Grease, Calamity Jane, Guys & Dolls, Annie, The Pajama Game and Me & My Girl. Trinity College has a very large and vibrant Music Program led by a team of dedicated and talented teachers. Students study music in the classroom from the beginning of their school career. In Year 4, students learn to read music and play with others by learning the recorder. In Year 6 they move on to the keyboard, Year 7 the guitar and Year 8 the drums, by which time the students are playing in small rock ensembles. In Years 9 and 10, music becomes an elective subject. Students develop their ensemble performance skills through participating in a range of class ensembles including concert bands, vocal groups, rock bands and small chamber music ensembles. Students studying this course are also encouraged to participate in the College Co-Curricular Music Program. Year 9 and 10 music students are assessed regularly as a soloist on their instrument and may be expected to perform as soloists for College music nights and other College events. Year 9 and 10 music students develop their aural and theoretical skills, use the Sibelius computer software program to arrange and compose music and study a general overview of the history of music and music in context in today's society. The Year 9 and 10 music course leads to music in Years 11 and 12 and to the Conservatorium. Across the College there are a number of Junior School and Middle School Choirs providing an excellent Senior Choir in the Senior School and offering opportunities through musicals. Year 4 students are encouraged to take up a band instrument and join the band program almost immediately. Across the College we have 14 graded bands culminating in the Senior Band and the Stage Band, both performing at a high standard. As well as the band and choir programs, a number of smaller groups run in the school; rock bands arising out of the Music in Industry Program and instrumental groups such as the Percussion Ensemble, Brass Ensemble, Guitar Ensemble, Flute Ensemble, Saxophone Ensemble and Clarinet Ensemble. To support this large practical program we have an instrumental music program consisting of 33 instrumental staff teaching over 800 students. Within the College, we have several concerts through the year. These vary from the College Music Night, to School Music Nights to Class Band concerts and the instrumental teachers put on concerts for their students. We also perform at a number of community events, eisteddfods and National Band Championships.